A New Age Old Scratch? Rather than belief in Satan or the devil waning under a tide of secularism in the United States, it appears to have grown a bit in recent years. In March 1957 Gallup asked U.S. adults, “Do you believe that there is or is not a devil?” At the time, 62% said they believed there was, 26% thought not, and 12% were uncertain. A decade later, in 1968, about the same share believed in the devil (60%) but fewer were uncertain (5%) and more noted disbelief (35%). By the 1980s, belief in the devil began to grow. In a 1981 survey in the U.S. conducted by Gallup at the request of CARA for the World Values Survey, 70% of adults said they believed in the devil. When Gallup asked in the May 2007, 70% of U.S. adults again stated belief. But just what do they believe in? A more recent survey indicates that people are not likely to believe in a “creature.” For many, the devil or Satan is a symbol of evil rather than a being (…CARA would have worded the question differently). Among the 85% of U.S. adults who believe in God that were asked the question, 69% see Satan more as a symbol of evil and 31% say their believe Satan is a “living being.” Evangelical Christians are among the most likely to believe Satan is a being (55%). Catholics are among the least likely to agree (17%). 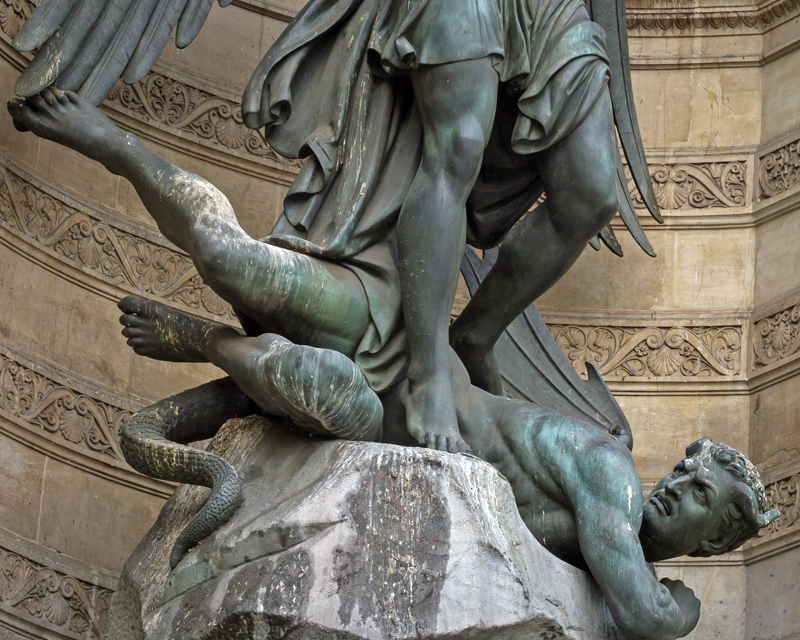 Eighty-three percent of Catholics say they see Satan more as a symbol of evil. What does that mean? Well symbols aren’t really going to stir the same concerns in someone that a being might. As we’ve explored before, Catholics who believe in the devil and Hell are more likely than those who do not to be religiously active. But there are other impacts we can see in the survey. 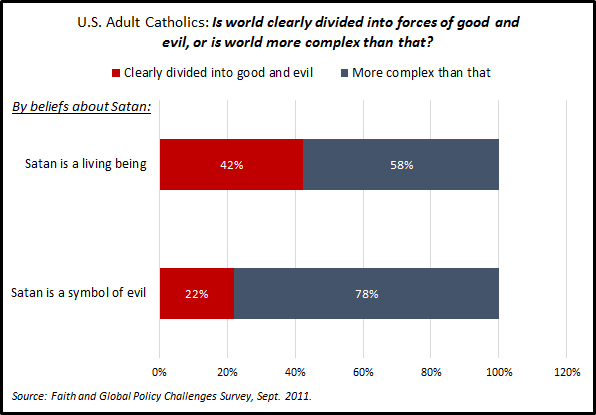 For example, Catholics who believe Satan is a being are more likely than those who believe Satan is a symbol to say they believe the world is “clearly divided into good and evil” (42% compared to 22%). Those who see Satan as a symbol are more likely to believe that the world is “more complex” than being clearly divided into good and evil forces. Eighty-eight percent of Catholics who believe in Satan as a being say they “feel there are spiritual obligations to act in certain ways” rather than that they “do not think in these terms.” By comparison, 72% of Catholics who believe in Satan as a symbol say they “feel there are spiritual obligations to act in certain ways.” The difference is much larger among Americans who do not have a religious affiliation but who believe in God. Among this group, 94% of those who believe in Satan as a being feel there are these “spiritual obligations” compared to only 29% who believe Satan is a symbol. In CARA surveys, we often find that Catholics will say that helping the poor is one of the most important obligations Catholics have and, indeed, believing in Satan as a being increases the likelihood that Catholics will agree that there is a spiritual obligation to “seek to reduce poverty and hunger around the world” (79% compared to 62% of those who see Satan as a symbol). Also, Catholics who believe in Satan as a being are also more likely to believe that there is a spiritual obligation to “seek to prevent abortions” (71% compared to 46% of those who believe Satan is a symbol). Catholics who believe that Satan is a being are likely to be conservatives (53%) and Republicans (54%). They are also likely to be among the more highly educated Catholics. Two-thirds of those who believe Satan is a being have either attended college (32%) or have a college degree (34%). 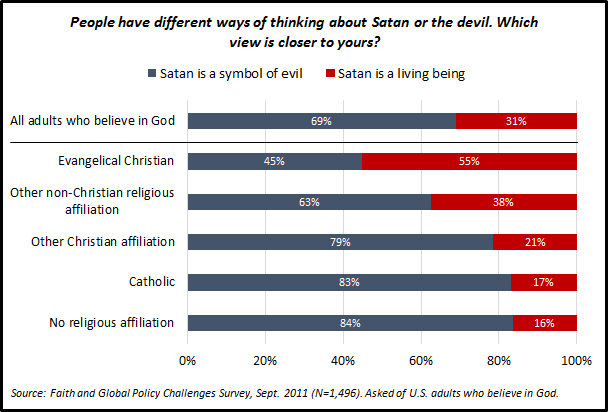 Catholics who believe Satan is a symbol are likely to describe themselves as moderates (49%) and Democrats (46%). They are more likely than those who believe Satan is a being to have a high school or less education (44% compared to 34%).